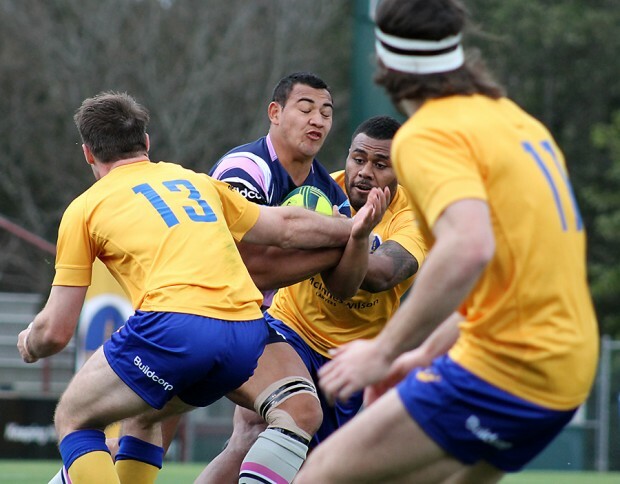 This was perhaps the most anticipated match of Buildcorp NRC rugby round 3 – Melbourne Rising top of the table and Brisbane City third placed – both undefeated. It was a match that would see the return of Liam Gill, out since the Premier Rugby Grand Final and more importantly for Wallabies watchers, the return of Will Genia, injured since the Reds v Highlanders match in May. As the clouds scudded across the sky and the temperature dropped, Ballymore was bathed in the atmosphere that comes from more than 40 years of memories – old and young had turned out to watch the NRC Rugby Round Three match at the home ground of rugby in Brisbane. Juniors in their team jerseys formed the guard of honour for both teams as they ran out onto the field – grass roots rugby at its best. Steve Walsh made his presence as referee felt immediately with two early penalties against Brisbane, which Melbourne Rising capitalised on with a try to fullback Jonah Placid. The restart was eventful as Nick Frisby was sent to the bin for a tackle on Telusa Veainu while the player was in the air – the crowd was with Frisby as he questioned his own brain explosion as he left the field. For a player who had been so instrumental in the first two wins for Brisbane City, this was an inauspicious start and it set the tone for the rest of his time on the field. Tries were, as the first rounds had suggested, the main aim of both teams and were traded between the two teams. Some loose passing from Brisbane City, and inside 6 minutes Melbourne Rising had their second try to outside centre Sefania Naivalu. Chris Kuridrani hit back for Brisbane City, followed by Samu Kerevi. Kuridrani and Kerevi played well off each other throughout the match making it clear that they had practiced their running and calls. 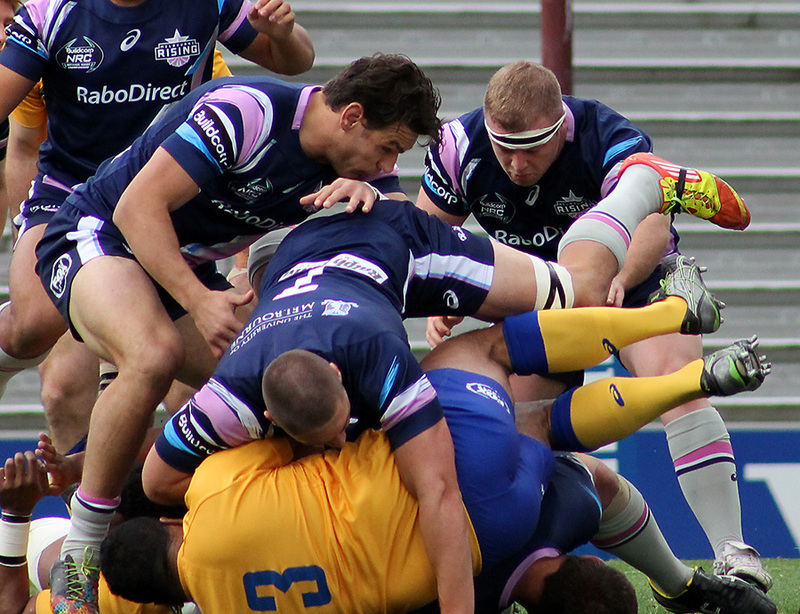 The match then became the Tom English show, with the first of his four tries and a successful conversion to Jack Debreczeni. Liam Gill scored for Brisbane City off a linebreak and pass from Jake Schatz, who possibly could have scored himself. Refreshingly for both teams the back lines were quick to offload to their support rather than retain the ball and suffer white line fever. 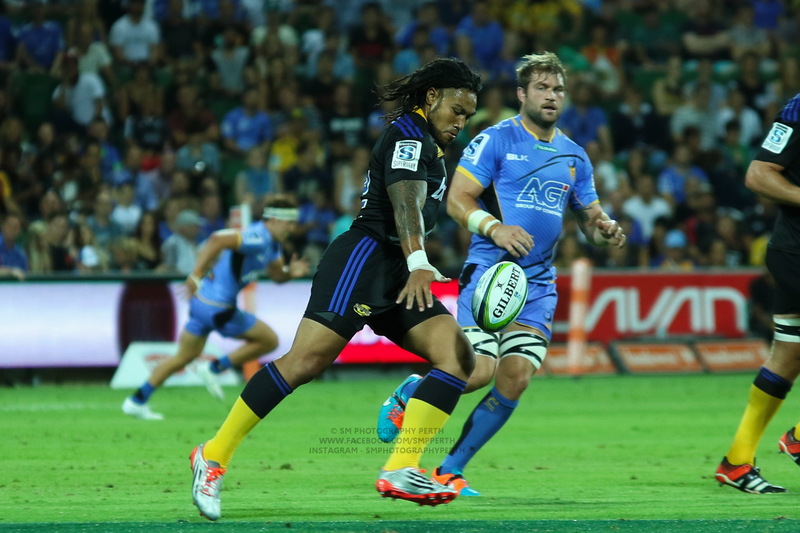 This was evident between Kerevi and Kuridrani for Brisbane City and English, Veaniu and Placid for Melbourne Rising. The crowd were excited as it was now three tries apiece and only 25 minutes in – if this continued, it was going to be a match for the tournament. Melbourne Rising stepped up their professionalism and maintained very strong defense for the rest of the half – their speed to the line and their use of the quick tap showed that they were absolutely the dominant team on the day. Their scrum with Sexton anchoring it, bested Brisbane City’s consistently, perhaps surprisingly for a team coached by the Reds forwards coach, Nick Stiles. Melbourne Rising’s fourth try was as a result of a pushover try, grounded by No 8 Lopeti Timani. The first half by Brisbane City was punctuated by poor tactical kicking and some elementary errors like kicking the ball out on the full – both Frisby and McIntyre were guilty of this, but Melbourne Rising had clearly dominated play in the first half quite successfully. The second half started with Will Genia on the field. And Frisby still there. In an interesting decision by Stiles, Frisby played out most of the match in fullback. The tries then re-started for Melbourne Rising with a second for Telusa Veainu in the 42nd minute. Stiles used his bench extensively in the return from the break, subbing Kite for Talaki as well as bringing on Faagase and Korcsyk. 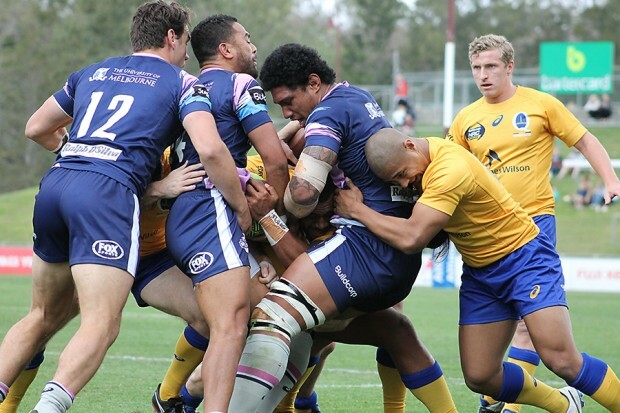 The scrum steadied after the changes, but the game escaped from Brisbane City with a yellow card to Genia and two tries to Melbourne City while he was in the bin – Timani and English scored their second tries. Jack Debreczeni converted both tries. While the scoreline could lead viewers to think that Brisbane City had no possession, they squandered most of the ball they had with loose passes, quick offloads that were intercepted or hit the deck and were gathered up by Melbourne Rising – at this stage a sense of panic entered some of the play by Brisbane City with missed tackles and misguided passes, calmly counterbalanced by the cool heads of Melbourne with another try to English for his hat-trick, and conversion by Debreczeni. Pat Leafa, Lloyd Johannson and Tom English all crossed in the last 12 minutes – with Johannson converting two of three goals. Melbourne were clinical in their tackles, forcing turnovers and scrambling play from Brisbane and remaining a strong cohesive unit. Full credit to Melbourne coach Sean Hedger for his preparation and the professionalism with which they executed all their plays – there was barely a chink in their defensive armour and their scrum and lineout held up well. With the final score of 79 – 18, there will be some soul searching for Nick Stiles and the Brisbane City team as they review the match and rue the basics not executed well. In spite of the chasm between the two scores, we were reminded what rugby is all about when Brisbane formed a guard for Melbourne as they left the field, and both teams stayed around to have a chat to the children who had swarmed the field at the conclusion. This is what NRC rugby can build – a great experience for club players to play alongside Super Rugby and Wallaby players (to chase and train harder to step up into opportunities like NRC and extended squads) and a chance for the kids to see their heroes up close, to dream big and talk about the time they met Will Genia. Will Genia’s yellow card and the two tries scored in his absence put the match out of reach of Brisbane City. Tom English, hands down. 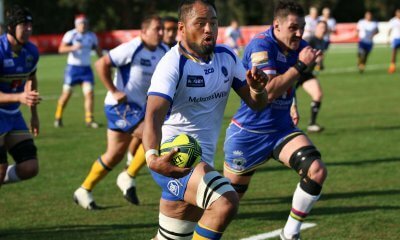 Some great running and tackle busts led to his four tries. Kerevi and Kuridrani work well around one another and could definitely form a key part of the Reds back line and bench. What was Genia’s card for? Cynical offside (basically ran around a ruck) 1m from his tryline. Was slightly harsh as Rebels got away with similar dumb play on their tryline in the first half, but he shouldn’t have done it. Yes Ash – the stupidity/brain explosions showed by both scrumhalves for City left me a little lost for words, and struggling to remain objective! Not good enough that the two players that we probably would’ve been relying on to organise a fair amount of our play both got yellow carded not long after taking the field. Wow. City just weren’t in the same league as the Rising for this one. Good to see Placid do well, and Johansson was a suprprise bonus. Cheers for the match report, Kate. A flowing writing style and all the scoring details included — no mean feat in this case! Thanks Kiap. I was losing the will to recap towards the end – 11 tries at this level, and Turnstile Tualagi wasn’t even on the field/in the state! JJ Taulagi is with the QLD country isn’t he? Exactly. He played fullback for them against Canberra yesterday, hence my comment that he wasn’t in the state. Felt like Brisbane City were in it up until Genia got sent off in the second half. Frisby at fullback was one of the worst experiments of all rugby history… He lost or turned over the ball every time he got it in the second half and didn’t have his best game at half back in the first half either. Needs to get more consistency. Genia looked like he needs a bit more rugby (understandably after 3months off), thank god we have the NRC and he can play again next week to get some more time out on the park. IIRC Frisby played 15 for the U20s a couple of years ago. Maybe not so much an experiment if Stiles was aware of that as I suppose he was. But also iirc he wasn’t much good at it then either. Great write up Kate! Our boys simply just couldn’t match it with the big men the Rising had. But in saying that our lads never gave themselves a chance going high in the tackle and grabbing around the shoulders was never going to bring them down. Something went fundamentally wrong with us yesterday and I’m not sure what it was. It was a very Reds-esque performance worryingly. The biggest concern for me though, wasn’t the missed tackles, it wasn’t the 79 points we conceded; it was the amount of times the Rising made a break in their own half and with 50m plus still to run, there was barely anyone chasing them! I’m going to steal that one. Gold. Great recap. Can’t wait to see a replay of this, sounds like it was a bit of a manshaming. Lopeti Timani looks devastating in open play, he’ll shape up for the rebel’s next season. Great write up. I caught the tail end of this one in youtube live. There was no clock on the screen so when the rising were up by forty I thought there must be a couple on minus to go. I was wrong. Looks like the rising are the team to beat, really impressive considering the class on Brisbane. I was surprised by the scoreline, but from reading the review it sounds like (a) 2 yellow cards are hard to recover from in a game as fast as the NRC clearly is, (b) City went to pieces and Rising kept it tight. Clearly the Rising were on their game, and City were not. And good to see Genia plays rusty, gets carded, and makes it back into the Wallabies squad. WTF?!!?!? Arty-farty. Loves rugby. Good cook. Contrary. Is a New South Welshwoman who has never supported NSW. Only has eyes for the Reds. Likes raspberries and that intense mustard-yellow most people don't.